Motorcycle riding gear is as much a necessary and intrinsic part of motorcycling as are good riding skills and a well-maintained motorcycle. 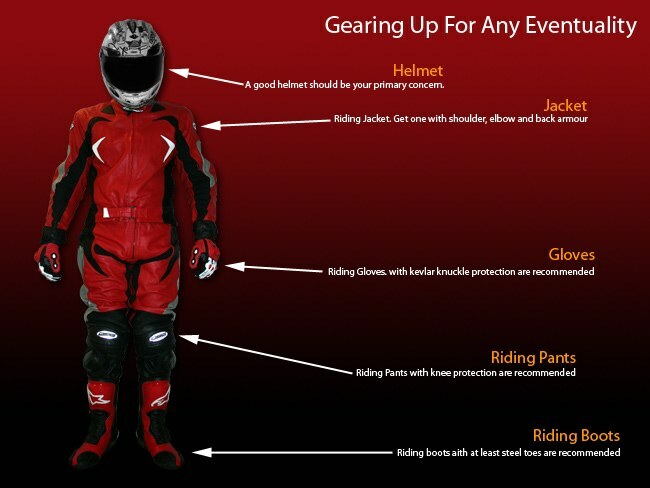 Riding on two-wheels while being exposed to weather and sans any protection from contact with either the road or other objects in case of a fall or an accident, his riding gear becomes the last line of defense for the rider. Let’s begin with the helmet. The human skull protects the brain inside but it has its limitations to the amount of forces it can handle before getting damaged itself. And of course ‘damaging the skull to save the brain’ is not an option in any case. The helmet is a prime protector. Its hard outer shell (which can be made of propriety plastics, strong polymers or even fiber-glass) is there to protect the head from any object that can penetrate the helmet on impact and hit the skull inside. Also, a hard, non-deformable outer protects the head inside better. A light, hard and strong shell that resists deformation makes for a good helmet. An energy absorbing liner forms the inside shell of the helmet. Made of high-density thermocole, polystyrene etc, this liner absorbs the energy of impact and does not allow it to get to the skull. This inner shell gets compressed and deforms in absorbing the forces of impact and so protects the head from injury. Ideally the thicker this inside shell, the safer is the helmet though there are limits to how thick it can be considering the size, bulk and weight limitations imposed by an equally large shell that would be needed. Inside the inner shell is a padded liner that provides a comfortable and soft layer next to the riders head and face. This contributes to comfort, provides for a snug fit and forms a cleanable inside for the helmet. In choosing a helmet, first and foremost look for either BIS (in case of Indian make helmets) or DOT approval (in case of imported ones). These ‘certification’ marks ensure that the helmet meets with certain rigorous and standardized safety standards and shall perform as expected and promised. Prefer a full face helmet to an open face one as the former obviously provides better protection. Look for as wide and eye-port as you can get, especially in the peripheral region. Prefer a clear visor and look for scratch-resistant hard plastic ones. A double-D ring fastener is far better than a ‘click’ type fastener for the chin strap. To check for fit, wear the helmet, hold it from outside and try to move your head inside side to side. A well-fitting helmet should allow very little head movement inside it. One that allows the head to move is loose and will not protect the skull well on impact. Not a mandatory part of safety gear, it nevertheless helps in a number of ways, especially the cotton variety. It helps in snugly fitting the helmet. Absorbs sweat before it gets to the inside liner of the helmet. Helps keep the nose and ears warm during a cold weather ride. And stops insects from getting between the helmet and the riders ears if he needs to ride with the visor open for a while. Road rash or abrasion of unprotected skin that comes in contact with the road when a rider falls from a moving bike is the commonest of all injuries for a motorcyclist. And very painful at that, for the entire duration of its treatment and healing. Riding jackets, with protective hard re-enforcements at specific places (like elbow joints, shoulders, back and chest areas) protect these areas from abrasion and injury. No, the riding jacket will not be able to save a bone from breaking if the fall is that bad but the skin nevertheless gets protected very well. Jackets also protect the rider from the weather (warm liners for cold weather, water-proof outers for rain and mesh construction for warm weather for example). When choosing a jacket, again look for the safety standards that it meets with. Look for good ventilation in case most of your riding is in warm weather. Vice-versa, look for a fabric/materiel that prevents water and wind penetration if cold weather is expected. Zippered fronts, all the better with a flap over the zipper, are far more effective wind protectors that buttoned ones. Leather, unequivocally, is the best materiel for riding jackets though expensive to buy and maintain. Modern textiles offer a wide choice of equally good and presentable materiels to choose from. A good fit means a snug fit for a jacket too. Too loose and it will neither protect well (the paddings will rotate under impact) and will disconcertingly flap in the wind at high speed. Too tight and it will impede movement, restrict free blood circulation in certain areas of the body and these two factors can adversely affect the riders ability to tide well. Again they majorly protect from abrasion and save the joints especially from injury through impact with small hard objects. Riding pants are also best made of leather but other fabrics are also up to the mark these days. And as in jackets, buy them according to the temperatures and humidity you expect for most of your rides. Fitting is again important and almost critical for pants cause the lower body gets the most contorted when riding a motorcycle. Look for comfort, esp. around the crotch and the knee areas. A riding pant that too tight here is not worth wearing. A relatively cheaper alternate to full riding pants are knee-guards or knee protectors. The knee and ankle joints suffer the most in case of a fall from a moving motorcycle and the knee-guards provide strategic protection to the vulnerable knee joint area. Made of hard polymers, either with a flexible hinge or pivoted to provide for knee rotation, these should be a tight fit around the leg to be useful. The tight fit endures that they do not rotate out of alignment on impact with the ground during a fall. The advantage with knee-guards is that they can be worn over or under regular jeans and can be taken off when the rider needs to walk around. The human hand is a delicate contraption. Thin and numerous bones form a multi-jointed framework that’s covered with a thin layer of flesh, except in the palm area. Protecting the hands, both from injury and weather, is a prime concern for any rider. And providing protection to a limb that is so flexible, tactile and delicate is quite a challenge. There is nevertheless a mind boggling choice of gloves available though admittedly the real good ones are a trifle expensive. Full fingered gloves are the best. Look for a good fit here too. And one that provides the best ‘feel’ of the controls through it. A glove too large for the fingers will interfere with fine operation of motorcycle controls. Too short in fingers and the nails and fingertips get painful from the pressure on them. Inner seams should also be well bound. Seam-lines that get inside the finger nails and under the palm are very annoying and get painful during long rides. Leather again is the best but good synthetics with re-enforcing inserts over knuckles and finger joints protect equally well. Double stitched seams provide for greater durability and better sealing in case of water-proofing. The inside of the glove should be of a non-slip materiel to provide good grip over the handle-bar mounted controls. And it should not slip even when wet. A gauntlet (or wrist cover) type glove is in fact the best design as it gives the best fit for the glove. Human feet are almost as delicate and flexible as the hand. And equally important role players in motorcycling where at least two major controls (gears and rear brake) are foot operated. They need to be protected not just from abrasion but also from potential injury when caught under a heavy fallen motorcycle with some parts that would be searingly hot. Boots need to be at least ankle high with a heavy sole and a re-enforced toe and heel area. Thick padded materiel for the upper and a strong and thick sole are mandatory for a good riding shoe. The sole should also provide good grip over the footrests even when wet. Whatever the means of fastening (laces, zipper or Velcro) the fastener should not come loose under any circumstances. Laces are dicey if they foul with the foot-rest, brake lever or gear lever while the rider is putting his foot down or raising it. So laces should be of just the required length and no more. The shoe should also provide some resistance to lateral rotation of the ankle joint. In fact, a good protective riding boot will not be all that comfortable for walking as it restricts flexion at the extreme angles to protect the foot from damage during a bad fall. Rain is an ever-present companion for any motorcyclist. In fact, riding in the rain has its own charm for a rider, probably owing to a heightened risk element there. Primary to safe riding in the rain, apart from good tyres , is being protected from the falling water. Wetness, even during a hot summer day, is a bedfellow of ‘coldness’. A wet rider is a cold rider. And also, a wet rider is a distracted rider. So wear rain protection. Usually, good riding jackets and pants come with water-proofing (except of course the mesh variety). But otherwise, rain over-suits are the best bet. Buy ones that are bright in colour, preferable with a reflective coating for better visibility and are a comfortable fit over and above your regular riding gear. Remember, riding in the wet means all the more need for protection in case of a slide and a fall. Silicone rubber coated fabrics are cheap and good and last enough to provide one their money’s worth. The only downside of most rain-gear is that it doesn’t breathe and you get wet inside owing to sweat and condensation of trapped moisture. But since rain suits are usually required for relatively short durations, one can live with this and carry on. Breathable water-proof fabrics are expensive but a far more comfortable option though.